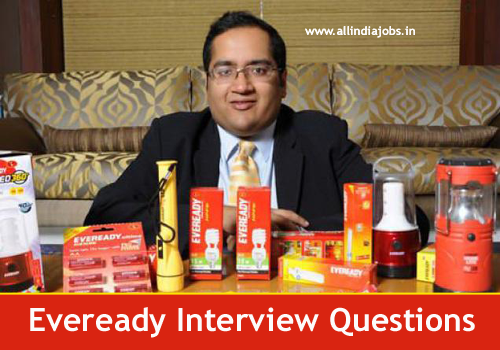 Eveready Industries Interview Questions [Technical & HR]: A very bright future is awaiting here for all the people who are willing to work in the corporate domain. Eveready is recruiting fresher and experienced graduates from different domains for various positions. Go through this article for further details like interview process and frequently asked technical and HR interview questions of Eveready industries. There is a pre-defined interview structure for the Eveready Industries. The interview process proceeds in 4 rounds. The online written exam includes basic arithmetic, aptitude and reasoning questions. It may also include English grammar or essay writing on a general topic. Technical interview will be different for experienced and fresher candidate. The technical interview for a fresher would be from his highest educational qualification and for that of an experienced would be based on his previous job. HR interview will be as usual for all of them. The technical interview will be so much easy for a fresher because they will be well equipped will the knowledge of their subjects. Also, they will be having updated and correct information filled up in their minds. So, it is better to face interviews immediately after completion of education. Here is a bright career opportunity waiting for you in Eveready Industries. Below are few frequently asked technical questions of various domains, go through them so that you can clear your technical interview. State the laws of conservation of energy? What are the two essential conditions of a perfect gas? What is a Carnot engine? Differentiate between intensive and extensive properties of a system? Which parameter remains constant in the isochoric process? Differentiate between tempering and annealing. In which process fluid expands but no work is done? Which machine will produce continuous work without receiving any energy from other system or surroundings? What is a dead state in thermodynamics? What is the difference between pyrometer, pyranometer, and pyrheliometer? What are the differences between fuse and circuit breaker? What is the Bundle conductor and why it is used? What do you mean by reach and reach the point of the relay? How to set the operating time of the relay? What is meant by synchronous condenser? What are the major categories of Electrical power system? What are internal and external faults? What is tariff and what are the various types of tariffs? Can we use higher voltages directly? What is different between resistance grounding system and resistance earthing system? What is the procedure for improving power factor? What is a differential amplifier? Also, explain CMRR. HR interview is generally conducted to analyze your decision-making capabilities and your reaction to different situations. Because you are a fresher nothing much is expected from you than team skills, adaptability and quick learning of things. The easy way to clear this round is to concentrate on what you are talking, be firm and maintain good energy levels. Lastly, never in your worst cases talk anything negative about you. Here are few commonly asked HR interview questions for a fresher. How do you feel about doing repetitive work? You have not done your PG yet. This is not a drawback, but don’t you think you should get a PG degree asap? What is the worst thing you did and how many of your friends know that? If you had 26 hours in your day, how would you spend those additional two hours? The technical interview for the experienced candidates will be based mainly on their past work experience and also to the post they are applying for. It is suggested to have an idea about the various projects the company is dealing with so that they clear the technical round easily. Here are some technical questions asked by Eveready recruiters for various positions. Can you tell me about your project management leadership style? What would be your initial step in starting a project? What is the procedure you follow in assigning the work to different teams? What is a difficult work situation you have faced and how did you overcome it? In your last work how many projects you have handled? What are the three key challenges for our industry today and what do you do to face them? What is the best project you have dealt with? Why did you feel so? How many smaller cubes are completely invisible in a n*n*n rubric’s cube? How would you fill out exact 4 liters in a Can of 5 liters and another Can of 3 liters, with an unlimited supply of water? What would you do to increase the Share value of our company? How do you deal with difficult stakeholders? What was a typical day like at your most recent job? What do you see as the key strengths of a business analyst? The most critical round of in an interview process is the HR round. Though you are an experienced candidate, still this would a tricky round. It is so because there is no defined question or a prefixed answer for the questions asked. The only thing that can help you here is the rapo generated between you and the interviewer. Hope you will do well and get the job by referring the given frequently asked interview questions. What are the expectations you have from your first job? Are you willing to change your role and profile when required for a project? What Qualities do you look for in your boss? Can you describe an environment or scenario where you would not thrive instantly? What quality in your co-workers irritates you? Would like to be relocated frequently? At the end of the day on what basis you conclude whether you worked committedly or not. If you were hiring for this position, what are the top five things you’d be looking for? Thank you for visiting our website, hope this will be helpful for you in your interview process with Eveready Industries. For more job updates in the private sector please keep visiting our website All India Jobs.